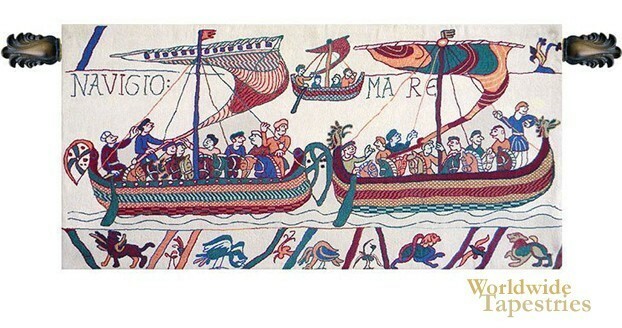 In this Bayeux Naigo Mare tapestry we see a scene from the voyage to the Battle of Hastings. Here we see the crew on boats crossing the English Channel, with a colorful medieval display on the sails and boats. Animals and mythical creatures are seen on the bottom border to decorate the work. This Bayeux Naigo Mare tapestry is backed with lining and tunnel for easy hanging. Note: tapestry rod and tassels, where pictured, are not included. Dimensions: W 44" x H 22"